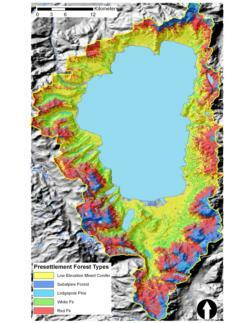 2) develop a spatially explicit reconstruction of the pre-settlement forest landscape conditions and associated fire regimes for the Lake Tahoe basin that can be used by land managers in restoring forest ecosystems. To achieve these goals, we have sampled forest structure, collected increment cores and fire-scarred cross sections, and measured fuel loadings in the remaining old-growth stands in the basin. Combined with data from previous studies, we have dendro-ecologically reconstructed forest conditions and disturbance history in plots to pre-fire suppression conditions. Next, we implemented a random forest model predicting forest type and structure using eco-physiographic variables. This model has been applied across the basin to produce a basin-wide map of forest conditions prior to major human disturbance. The goal of the workshop was to inform managers about pre- settlement forest condition, demonstrate products to users, and receive feedback on the project.